Does Aloe Vera Juice Help Kidney Failure? Aloe vera juice is a clear liquid derived from the leaves of the Aloe barbadensis plant. Aloe vera juice contains many nutrients and displays both antiseptic and anti-inflammatory properties. Kidney disease has a number of causes and manifestations and sometimes ends in kidney failure if not properly remedied. Kidney failure is life threatening and a medical emergency often requiring kidney dialysis. Consult with your doctor about fluid intake and the pros and cons of aloe vera if you have kidney problems. Aloe vera is a species of succulent plant that thrives in arid climates. Juice and a gel-like substance can be derived from its leaves. Aloe vera juice is applied to external wounds because of its antiseptic and anti-inflammatory effects, but it can also be consumed internally for medicinal purposes such as combating infections, purifying the blood and mitigating gastrointestinal upset, according to the book "Medical Herbalism: The Science Principles and Practices of Herbal Medicine" by David Hoffman. Aloe vera juice contains a variety of biologically active compounds. Aloe vera juice contains minerals, vitamins, sugars, enzymes, lignins, saponins and anthraquinones, all of which impact your body. According to the "Encyclopedia of Natural Medicine," lignins allow deep penetration of tissues, saponins exhibit antimicrobial properties, anthraquinones are analgesic and combat pain and compounds called indole acetic acid and gibberellin account for the anti-inflammatory and wound healing behavior of aloe vera juice. According to a survey published in a 2007 edition of the "Journal of the American Medical Association," kidney disease is one of the top causes of death in the United States, affecting an estimated 13 percent of Americans. However, only one in 10 people know they have kidney failure, because the disease isn't usually noticeable until the organs lose at least 75 percent of their function. Common symptoms of kidney failure include high blood pressure, malaise and nausea due to toxin and waste buildup in the blood, kidney pain, hormonal disruption and edema. According to a study published in a 2004 edition of the "Indian Journal of Experimental Biology," aloe vera extracts protected the kidneys of rats from significant degenerative effects associated with type 2 diabetes. These degenerative effects were diminished in the kidney tissue of diabetic animals given glibenclamide and aloe leaf gel and pulp extracts. MedlinePlus warns that high doses of aloe latex have been linked to kidney failure and other serious conditions. Aloe gel or juice is the clear substance found in the inner part of the aloe leaf, whereas aloe latex is yellow and comes from just under the plant's skin. 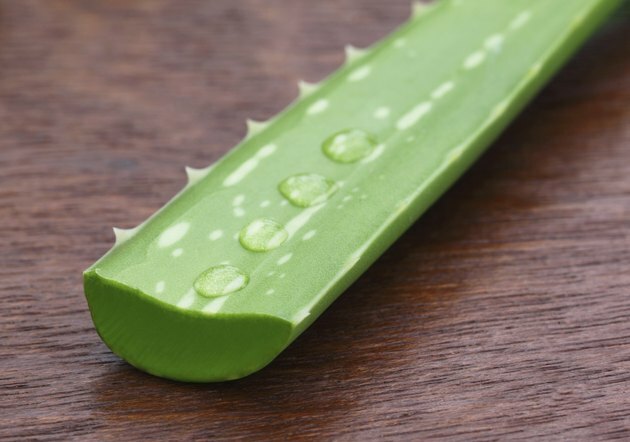 Some aloe products are made from the whole crushed leaf, so they contain both gel and latex. Consult with your primary care physician before supplementing with aloe vera products.